There are so many unemployed graduates in Nigeria searching for Jobs seriously, not to mention millions of Universities and Polytechnics undergraduates hoping to get a high paying job when they are done with their studies. But, do you know that having a good qualification, being so intelligent, so smart & super-alert could get you a good paying job at Google Nigeria ? Google is an American multinational corporation specializing in Internet services and products which includes Search, cloud computing, software, online advertising and latest technologies. I guess you are familiar with Google but if you are not, full details about Google can be seen here. 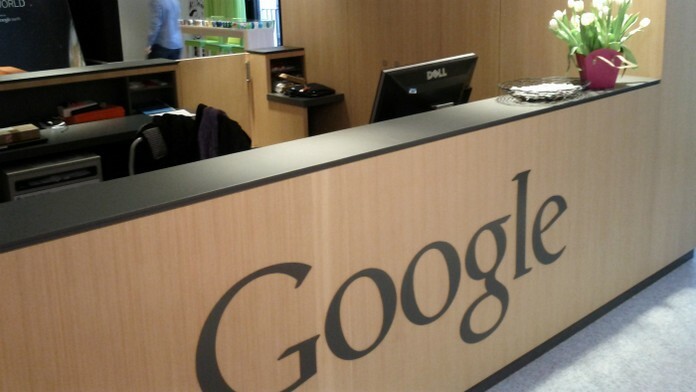 Google employ workers almost everytime, not just workers but skillful and intelligent workers. There are Job opportunities in different areas like Software Programming, App Developing, Products Marketing, Technical Account Managing and so on like that. Google's got a branch office here in Nigeria which is known as Google Nigeria and it is located exactly at Third Floor, Mulliner Towers. 39 Kingsway Road, Ikoyi - Lagos, Nigeria. 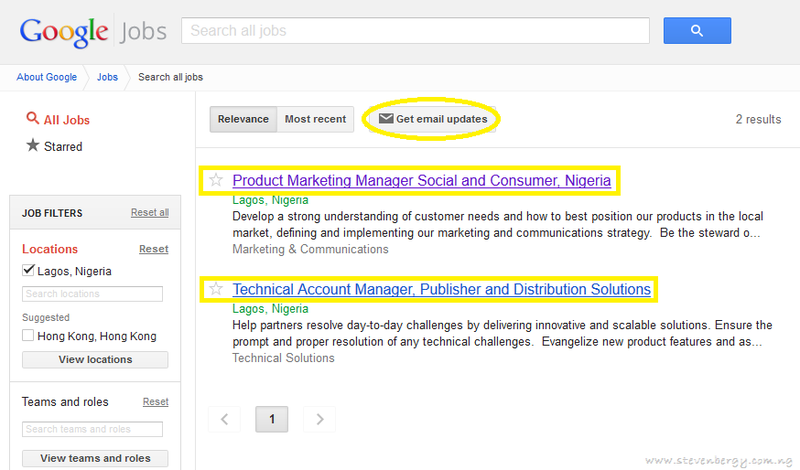 Presently, there are some job opportunities which you can check & apply for here -> Google Nigeria Jobs . 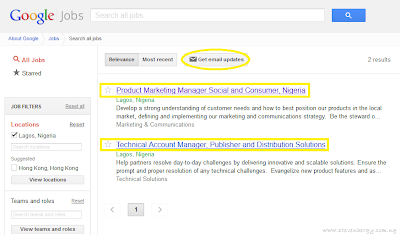 But if you can't see a Job that fits you, you can keep checking back since the site gets updated with new Jobs daily, weekly and monthly depending on the availability of Job opportunities or just click on the Get email updates button to get those Job alerts directly into your email account (More details in the picture below). We wish you best of luck as you struggle for whats best for you. Hope this helps !